"I have run 44 Doubles," says Double Racing creator Bob Anderson, "I enjoy having the break. It gives me a chance to recovery, make adjustments and talk to other runners. I enjoy Double Racing as much or more than a straight race. Never thought I would say this." Times for both stages are added together for scoring. During halftime we provide everything you need to recovery. Or bring along your "secret" recovery drink, food or device. 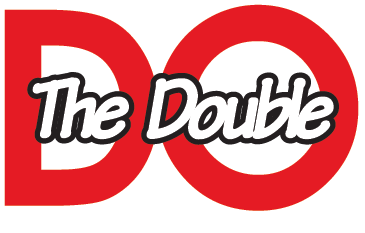 The Double is fun, challenging and exciting! Double Racing for the whole family - Loads of Fun! All Double Racing events have two stages. The first being longer than the second. Everyone will experience the Double halftime between the stages. The start of the second stage is called the restart. This is the amount of time from the start of the first stage. The faster you run the longer your halftime break. Special Medal for all finishers of both stages. Non-timed event. Special two-sided medal to all finishers. Two-sided medal for all finishers. Special medal for the winner for each age (from 4 and under to 13) Trophy for first boy and girl. non-profit youth running programs nationally and locally. Bring along the kids (13 and under) for the Bob Anderson's Kids Cup Double. The kids first run 1 mile and then 30 minutes later the 1/2 mile starts.